Designed by Magic hall of famers Darwin Kastle and Rob Dougherty. 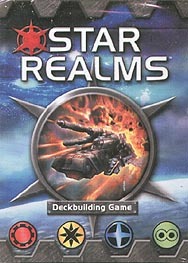 Star Realms combines the fun of deck-building games with the interactivity of trading card game-style combat. As you play use trade to add new ships and bases to your deck. When played those ships and bases generate powerful effects, additional trade, and combat to attack your opponent and their bases. If you reduce your opponent's score to zero, you win! I picked this game up having heard good things about it and enjoying the artwork and I'm glad to say I've not been disappointed by the gameplay. Deckbuilding is one genre that I haven't had too much experience of as these games tend to be heavily fantasy themed which isn't really my bag. I have played Dominion and found it to be fairly flavourless and not very thematic at all so found it a bit 'meh'. This game however, I LOVE. The process of building up your deck now has thematic meaning as you build up your factions to grow a fleet capable of heavy combat and defeating the opposition. I love how the 4 factions have different characteristics that they can bring to your deck, such as the out and out damage inducing 'Blob' faction or the cash bringing, healing qualities of the Trade Federation. Build your deck a certain way as there are different legitimate paths to victory. I love the concept of the Bases and Outposts as well, adding an extra strategic flavour. In terms of 'bang for your buck' surely this has to be in the top 10. Highly, HIGHLY recommended. Star Realms is a lovely two player deck building game. The great thing about this game is that it is small so incredibly portable. Like with all deck builders you have the opportunity to purchase items from the middle row (ships and bases), these cards give you purchase points to spend, attack power, health or if you have cards of the same faction bonus actions such as making an opponent discard cards or KO cards and some give you the ability for you to draw more cards. The whole point of this game is to buy enough cards to be able to damage your opponent and get their health down to 0. In order to protect yourself you can buy bases which when played are put in front of you, when your opponent does damage to you if you have a base in front of you they have to attack the base first thus protecting your health. For what is a very small game there is alot of strategy and gameplay in the box. There are expansion packs that can also be brought to add items to the game (although at the time of writing this I haven't looked at the cards in mine). I really think this is an excellent game for anyone - for those new to deck builders this is a good one to start with as it enables you to learn the concepts of building a deck and attempting to take the other player down, and due to its price is a very good deck builder for those that don't know whether deck building games are really their cup of tea! Some of the more popular deck builders although brilliant are very expensive so its a bit of a risk to buy if your not really sure this is the type of game you will like. Its also great in terms of its portability and its price point means you get a lot for your money. One I will definately recommend and one I can see me playing for a long time to come.